I paid $800 for my 91 Firebird 3.1. No stero, needed a new alternator, needed some front end cosmetics, 120,000 miles. Now that I'm almost done with the body work, she's a beautiful car. Couldnt' put a price on her. Now that I'm almost done with the body work, she's a beautiful car..
$700...plus about $125 to get through inspection. 89,000 miles, hardly any rust, and runs like a dream since I yanked the cat. Quite a deal in my area since just about everything its age is a rust bucket in Maryland. I paid $700 for mine from my mom's friend because it had a bad oil leak. Stupid small-town shop...put the oil filter on as TIGHT as it would go (I never did tell the lady that that was the only problem) Radio and tape deck worked, new front calipers, new brakes, BRAND NEW headliner installed three months prior, 116,000 miles. 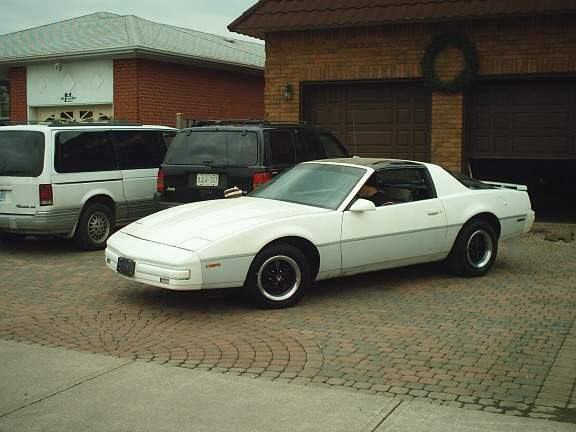 Lets see...$8000 for a 1986 Camaro 2.8 in 1988, around $5000 for a '91 Firebird in 1996, 3.1, power everything and t-tops, and my current '90 Firebird 3.1 $4500 in 1999...t-tops, no power anything, about 130,000 miles right now. No mods at all except a Kenwood cd player and a K&N filter. All of the usual suspects have been replaced at least once, water pump twice. Parents paid $1500 including tax and title for my `90 RS about a month or so ago. Needed work though. miscellaneous lights that were burnt out, replaced. and thats about it. Not bad for my second car. 105,000 miles on it with no leaks. Last edited by midget_man1387; 05-22-2005 at 04:42 PM. Paid $2600 for a 1991 RS V6 with $153,000 miles. Body was straight, no rust(except a minor amount around the windshield), Interior like new; rebuilt engine and diff; no curb rash on the rims- very nice ride! Clay bar to the paint and it looks like new! Unfortunately, the trans dropped out of it after 30 days, but 'Oh well'... all in all, I am as happy as a clam with this car. Had a guy in a $94,000 Masarati compliment me on my ride, as well as another guy in an $80,000 Jaguar- could have bought around 30 of my cars for what they paid for each of their's! Laughed MAO! Smoked'em at the lights. too...! $2800 for my 91 Camaro RS 3.1 , catback exhaust , everything else stock , no body damage , 89,000 miles , bought from 2nd owner , all maintance and replacements were documented and paperwork kept , all origional paperwork and books came with the car new . Hatch pull down motor doesnt work lol. Other than that almost in mint condition exept the LITTLE tear in the headliner and the passenger side visor hangs. almost forgot car had all clean tags and was current on its emissions and registrations. no accidents or bad little bugs hiding anywhere. did have a few problems with some sensors going out and wires being alittle old but havent caused me TO much pain. Paid $510 through Ebay. I got lucky..
1 owner, minor body damage, no problems other than an altenator i had to replace. And I am talking about a 3.1 V6. Since I got it so cheap I felt spoiled, so I bought an 89 Formula for $800 which is a POS! So u dont always get what you pay for. 1 owner, minor body damage, no problems other than an altenator i had to replace. Had 106K miles, now 112K and its running fine. And I am talking about a 3.1 V6. Since I got it so cheap I felt spoiled, so I bought an 89 Formula for $800 which is a POS! I will sell it soon. only thing wrong with it is a bad fuel pump. guy wanted alot more for it (and it was worth more too), but hes in the navy and had to move asap. the ad for it sat on the local message board right up until the 2days before he had to move.. i offered all i had (i just moved into a new apartment) so it was only $200.. he said no.... the next day, i got a call back and we worked out $300..
since it didnt run, 90% of the people who wanted it, couldnt come get it.... luckily, i have friends with trailers. im just fixing it up (normal tuneup, wear items, ect...)... this fall, im going to give it to my little sister for when she goes back to school..
$750 for my 92 Firebird..needed hood/fender/bumper cover/headlight. Lets put this int perspective......$2400 more in parts alone just this month. Unlike most that build "hot rods" and spend thousands on a car that is a garage queen and is driven maybe 10 days a year, I spend money on my primary cars and drive the crap out of them. I enjoy my money spent, I enjoy it daily. Yes I do have two garage queen also though,but liketto have unusual daily drivers that are unklike anything else on the road yet very very reliable and funtional. I bought my 1986 firebird for 500 bucks. front bumper cover has damage under the bra. I am putting a new cam & new headers on it and various 3.1 parts I'm pulling off one in the junk yard. When all is siad and done I will have between 1,000 & 2,000 dollors in it, that's including the original cost of the car and I should have a car that has at least 75-100 thousand miles left on it, if I don't screw something up in the rebuild...lol. I've havn't screwed one up before but you never know. I will say this f-body & 2.8 is alot better to work on than my old grand am with the quad4 (piece of ____). Last edited by bstieboydp; 06-28-2005 at 03:26 PM. I paid $2600 for my 91. Some body work and minor rust but not bad. Since i bought it i changed the weatherstripping, cat, y-pipe, and headliner. Came with original set of rims and tires and Corvette rally wheels and rims. Heh, I forgot to add, my car came with the extremely PIMP, cannot be topped, BUICK RIVIERA WHEELS. With tires that were too large for the car, maybe there's something the water up in Utah? Last edited by ShinZ; 07-13-2005 at 10:07 AM. got y'all beat......and thus far I have put 4 years and ABOUT 4000 into it. nope... i think im still winning... i have 425 in mine. total. tags and all. counting everything except gas and insurance. I bought my 1985 Camaro SC in 1992 when I turned 17 and paid $1700 for it. It is Copper colored with copper interior. Body was perfect and interior was a 9 out of 10. had 66,000 miles on it. Manual windows, hardtop, stock radio, etc. Has A/C. It now has 249,000 miles on it. Since I bought I have changed the air filter. 3 year later it still has Maacos quality work ......but has needed a cat back ("excuse me sir...your muffler is dragging" seems like a good enough reason eh? lol) ....but she still keeps going! <img src="http://img.photobucket.com/albums/v298/Redsand5101/DSCF0504.jpg" alt="Image hosted by Photobucket.com"><br> My first third gen firebird I bought a few years back. It has a meager silver paint job from maaco. Aswell as an aftermarket convertable top. Which was not of the highest quality but sure was a rare car.<br><br><br><img src="http://img.photobucket.com/albums/v298/Redsand5101/whitecar.jpg" alt="Image hosted by Photobucket.com"><br> This is my 2nd 3rd gen. Same year and everything except it has 39k miles for only $4750! In amazing condition. It belonged to an old old lady who just drove it to the supermarket and such, she recently died and they family needed to sell it. However, all I'm planing to do is some 17in Ronal rims and I already have my sound system installed, I am very happy with it. no oil pump, screen or pan. Last edited by goatnipples2002; 08-15-2005 at 07:55 PM. A shortblock is usually everything except tin, but this one is short the oil pump, screen, pan and gaskets/bolts needed. Last edited by goatnipples2002; 08-16-2005 at 04:41 PM. Axle/Gears: ? , 3.55 8.8", 3.64 7.5"
Last edited by two60two; 08-16-2005 at 10:38 AM. My daughter bought a 1987 Firebird with the 6 banger in it. Front seal is bad on the compressor, Im not sure if I should put the time into replacing it or just buy a whole new compressor. Last edited by rt_demoltion; 08-18-2005 at 12:30 AM. I paid $250 for my 87 2.8 Camaroand the guy thought it was an 86. First off the car somked and wouldn't start unless it was cool outside. So I replaced the computer and fixed the starting problem. Then I found out that the rocker arm was not on the push rod intake valve on the #4 cylinder. So I did a good job at taking it off of his hands because he had no clue that it was just minor issues. That was 3 months ago. Well as of today I have installed a new cam and will be looking to change out the exahust while adding a chip into the mix sometime or another. No body rust at all so I will keep it for a long time. Every v8 I looked at was all rusted out and couldn't match up to my 6. Now I love the car and with the little additions, I will not be looking for an 8 anymore. 1987 chevy camaro,86,000miles. needs new paint, couple of small dents,alittle rust, 2 sets of rims, after market muffler, $600 bucks off some stupid college kid.. wanted 1200 and went up to him with 600 cash and he signed the title!